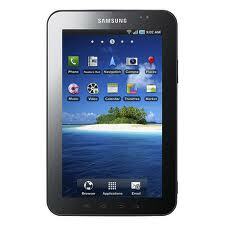 I have been using the Pulse News App on my Android Tablet, a Samsung Galaxy Tab 7.0 from T-Mobile, to find and read top news stories as well as specialty news for my industry of social media, mobile apps and marketing. So, when I say the article below, in The Co. Create Newsletter, about Pepsi Branding their own version of Pulse, I had to share it. To me, this is a creative branding move in the world of Mobile Apps, similar to Angry Birds producing a Rio version of the game to go along with the release of the 20th Century Fox Movie. I expect this to continue as a trend for monetizing Mobile Apps and energizing brands. What do you think? Pepsi has launched its first global campaign around the theme of “Live for Now,” both a rallying cry and a spirit the company hopes to embody with a pop-culture-focused campaign. Based on extensive global research with thousands of fans, “Live for Now” launches in the U.S. May 7 and will be centered around a major new social and content curation platform, Pepsi Pulse. “Live for Now” came out of “the desire to build a global positioning for our flagship brand Pepsi,” says president, global enjoyment, brands, and chief creative officer of PepsiCo, Brad Jakeman. “It’s the culmination of 9 months of work around the world to understand the unique place that Pepsi already owns in people’s hearts and minds.” Jakeman says the research revolved around finding out how Pepsi “loyalists” defined themselves, and he says that what emerged as a theme was “the notion of making the most of every moment.” Now that’s being translated into an overall global campaign statement, one anchored by the ambitious new social platform, Pulse. An extension of a tool launched last fall, Pepsi Pulse marks an ambitious foray into social and also a brand-wide re-emphasis on pop culture and entertainment, long a Pepsi staple. “It’s not enough for a brand to just say something, they also have to live it,” says Shiv Singh, global head of digital at Pepsi Co. 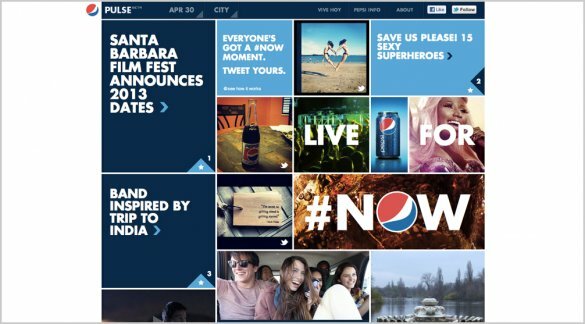 In the spirit of what the company is calling the Now Culture, the HTML5-powered Pepsi Pulse will provide engaging aggregated content for users, with immediacy and interactivity. Pepsi Pulse serves as a “dashboard of pop culture,” curated by Pepsi, pulling pictures, tweets, and news items from premium content sources, filtered by social ranking, to gather the top 10 stories at any given moment. Users will also be able to organize content around categories such as music, design, and sports. Aside from producing these pop-culture cheat sheets, the site will also livestream concerts and feature an interactive component, with challenges from musicians and celebrities like Nicki Minaj who have endorsement deals with Pepsi. Nicki Minaj, for instance, might ask her 10 million Twitter followers to send her pictures of their alter egos (hers is called Roman Zolanski), which will then be displayed on Pepsi Pulse. The brand has been moving toward beyond-advertising social efforts for the last several years, starting with the Refresh Project in 2010, which allocated $20 million in grants to causes generated by users online. Last fall, Pepsi introduced a social site called Pepsi Sound Off tied into Simon Cowell’s reality singing competition show, The X-Factor. Created to foster a co-viewing or social TV experience, and modeled after Twitter, Sound Off provided fans of the show a chance to interact with each other, and with the show itself, by posting comments in a stream, and promoting other people’s comments. Those that received the most “likes” would end up featured in custom 15-second spots running during the show. Pulse is an extension of the platform and embodies the marketing shift from ad messaging to continuous engagement. Pepsi CMO Simon Lowden says that the development of the platform reflects the importance of connecting with audiences across all platforms and the acknowledgement that divisions between things like media, ads, and technology are ad industry constructs that have little relevance to the way consumers actually behave. He also notes that Pulse makes the most of Pepsi’s heft when it comes to culture-based assets–whether that’s its longtime sponsorship of the NFL or its relationship to musical artists. “We now have a platform to leverage that work,” says Lowden. Pulse is launching in beta now and Lowden says over time the brand will build in other features, like geo-targeting and special offers with selected partners that focus on “how to make the most of now.” Partnerships will include those with daily-deals sites to promote special events across the U.S. Pulse will live at its own web destination as well as on the Pepsi home page. The first “Live for Now” ad will appear across the U.S. on May 7 and will feature Nicki Minaj’s song “Moment 4 Life” and Minaj herself in a cameo. Perfect gucci bags, trendy and thus pragmatic. Does probably not wear which include ordinary gucci bags, but that is everything expect to see by having high-performance gucci bags honest safe music downloads.